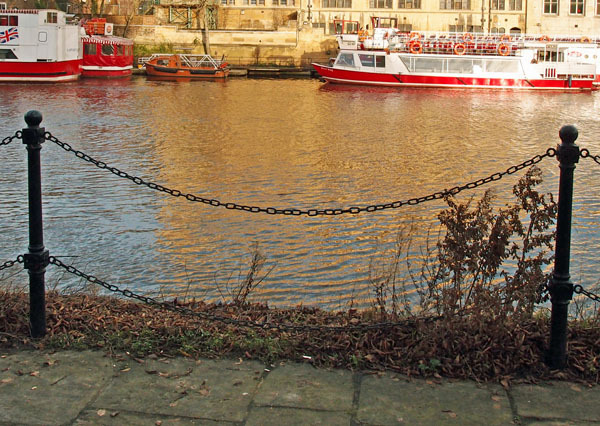 A new addition to the section of river bank near Lendal Bridge, these posts and chains have been installed to form some kind of division between the riverside walkway and the waters of the Ouse. The appearance of these new barriers has certainly divided opinion, judging by discussions with friends and online comments made in response to a recent article in the Press. There have been several deaths in recent years in the city’s rivers, and in particular, in this particular place, we’re thinking about the death of Megan Roberts, who apparently entered the river somewhere near here, after heading down Tanner’s Moat, past the Maltings pub. It’s clear from talking to friends and reading online comments that some people think all extra measures are a waste of money and that the problem is actually about alcohol, and young people drinking too much of it, and that’s what should be tackled, in the form of education and changes in behaviour. There have been high profile campaigns to warn young people in particular of the potential dangers of the city’s rivers, particularly when you’re drunk. Barriers and new lifebuoys are a more visible sign of a wider concern over the number of river deaths in recent years. The barriers here at this particular place are the result of campaigning by Megan’s mother and friends, though they’re also part of a general reappraisal and improvement of river safety measures. I’d like to write more about that later, perhaps. A letter to the Press recently expressed frustration that this new barrier fencing was completely inadequate. The comments underneath the letter probably reflect the majority view, that we recognise that it’s impossible to fence off the river to prevent all danger, and that this is probably the best we can do. A determined person who really wants to get near the river isn’t going to be deterred by a couple of bits of loose chain hanging off metal posts. But a very drunk person who feels they want to wander down there won’t find it so convenient and will probably head off elsewhere, hopefully away from the river’s edge. I guess that’s the idea. Looking at this new barrier made me think about the difficult job our councillors and other officials have, trying to find the right response when tragic events occur. It made me think, and not for the first time, about the difficult balancing act involved in managing the city and its landscape and its structures. 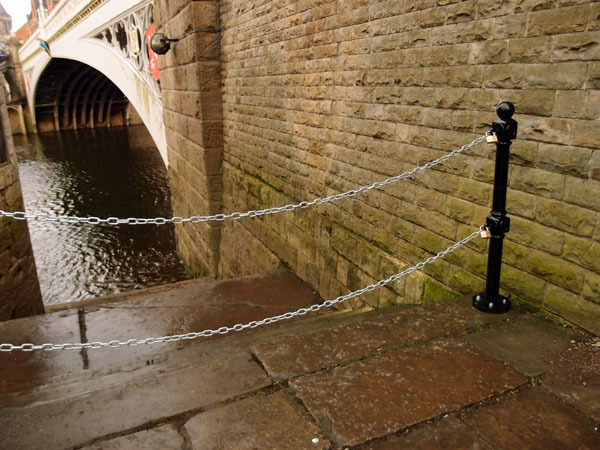 It’s worth pointing out that the new section of barrier is similar to existing fencing to the other side of Lendal Bridge, opposite the Guildhall, where it appears to have served its purpose effectively for many years. I guess we’ll never know if the new fencing to the other side of the bridge prevents anyone falling into the river at that particular point, but let’s hope it does. It seems a reasonable thing to spend money on, all things considered. There are many angles and aspects to consider, in thoughts on what one Press headline termed our ‘danger rivers‘. A lot more could be said on the wider subject of river safety. Perhaps another time. By Lisa @YorkStories • 1 April 2015 Details, Opinions, thoughts, Rivers, floods To link to this page's proper location please use the > permalink. « Shambles market: ‘significant improvements’?